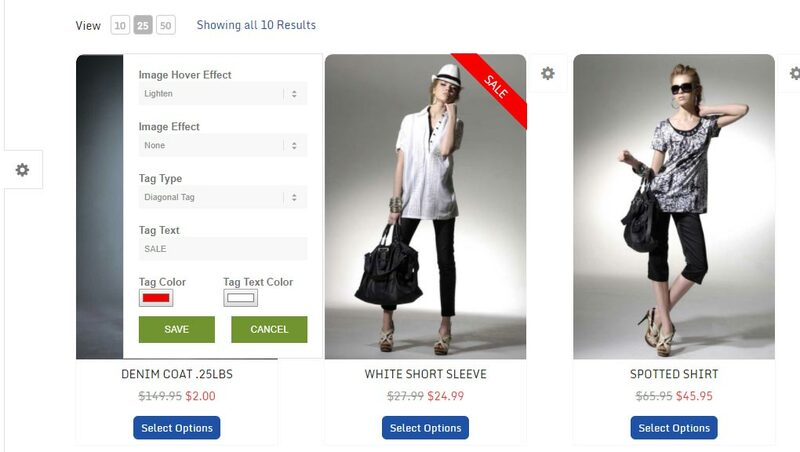 Image tags allow you to add a custom badge across your product for sale items or other fancy mark-ups. We offer several different badge types to choose from, including adjustable color and text for a custom look. In this example, we setup a red ‘SALE’ tag across a product to designate its nature. You can choose from diagonal, square, round, or classy. You can choose to setup the image tag on the front-end using our product customizer by selecting the white/gray gear icon next to each product. Note: These front-end product customizers are only available when the administrator is logged into wordpress. Regular customers do not see these options. To setup an image tag inside the product editor, simply use the panel to select which type of tag you want to display over the product, the text to display, and choose your background/text colors.